Sat., April 7, 2018, 10:10 p.m. Freshman Alek Jacob pitched 7 2/3 strong innings and Branson Trube hit a two-run homer in the eighth Saturday as Gonzaga blanked Portland 3-0 in a lightning-delayed West Coast Conference baseball game at Washington Trust Field at Patterson Baseball Complex. Jacob struck out eight, walked two and allowed three hits. The Pilots (10-18, 4-7) put two runners on base in the eighth, but reliever Calvin LeBrun ended the threat with a strikeout. Portland starter Corbin Powers struck out the side in the seventh after a lengthy weather delay in the bottom of the sixth. Powers (3-4) had a career-high nine strikeouts but surrendered Trube’s two-run homer to left, his fifth of the season. Closer Casey Legumina of the Bulldogs (15-14, 6-5) recorded the final two outs for his eighth save and second in two nights. 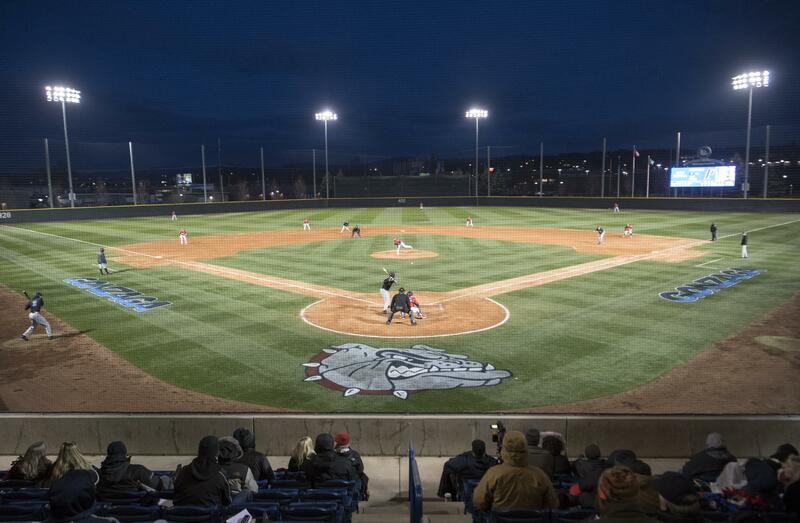 The Zags won the series opener 6-4 on Friday. The teams will complete the series at noon Sunday. Published: April 7, 2018, 10:10 p.m.